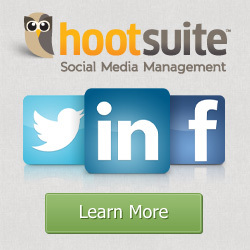 Hootsuite Aquires Seesmic - Changing the Face of Social Media Management! Seesmic announced on Thursday, that it has been acquired by Hootsuite! 2) Enabled you to see real-time updates (posts, tweets, mentions) of your social media accounts and respond to same. c) Where the top referrers to your account came from. d) They even allow you to import the Google Analytics data for your account, so that you can further drill down your account performance by other parameters such as user behaviour (visitor frequency and whether or not these visitors are new or returning) and the type of device that your users use to access your account profiles. The basis of the Hootsuite-Seesmic acquisition may not be evident to users, but Hootsuite had to make a preemptive strike to gobble up a competitor that had every intention of adding analysis to its suite of tools. 2) It automatically gains Seeismic's user base which is approximately 22,000 US visitors/month, visitors, whose incomes are in excess of $100,000/annually. Well, we wish Hootsuite all the best, for as long as they keep making social media management, easy and efficent, they'll always have paying customers! For those interested in company IPO's, Hoostuite is definitely a company to watch for the future! Brian Solis shares his interesting take on important Twitter accomplishments for 2011-2012, in his infographic, "The State of the Twitterverse 2012". (Really an adaptation of the "Twitter 2012" infographic from Infographic Labs). Top 3 countries for Twitter users - includes Brazil at #2..hmmh..should you be looking to South America and maybe redirecting some of your marketing efforts there? The Top 5 Moments in Tweets..tells you what media vehicles and programs you should be concentrating on, to get the eyeballs of your younger target market. 1 million Twitter accounts opened every day. "Top 6 reasons for Retweeting"
"Top 4 Ways People Decide to Follow You"
...may want to change your marketing strategy a bit, if you think that celebrities are the only way to get your message to your customers on Twitter. (NB: You may not need to go for an official brand page on Twitter..which will cost you upwards of US $25,000, but you should really have a Twitter presence for your company, yourself and your brands). You don't have to go it alone, contact me and for a small fee, I'll set up and manage your Twitter account for you!